"Princess with Peas" is a cross-stitch chart with instructions translated in English. 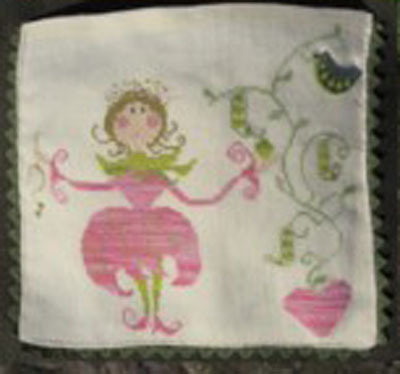 It includes a green charm in the shape of a peas' pod as well as finishing instructions to make an apron for a four-year-old and mount your work on it. Special stitches: This is a pure cross-stitch design with a few back-stitches. The model on the picture has been stitched on a 36 count linen fabric (colour "Ivory") using two strands of cotton over two threads of fabric. Recommended Fabric: of your choice regarding the type (linen / evenweave / Aida) and the stitch count, colour "Ivory", 45x45 cm (18x18 in). This product is a cross-stitch chart + a peas' pod button + finishing instructions translated in English.